Denver, CO – The Rugger’s Edge and Study & Play USA are proud to continue their partnership for 2018. 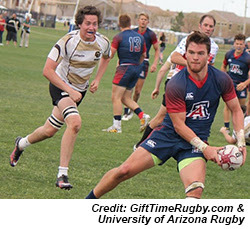 “As the popularity of studying and playing rugby in the U.S. continues to grow, working with a company like Study and Play USA was a natural next step for The Rugger’s Edge,” Karen Fong Donoghue, founder of The Rugger’s Edge said. We provide the knowledge, experience, expertise and genuine care for student-athletes to choose their life journey – traveling to the USA to live, play, learn, compete, study, grow and develop in a purpose fit University environment.